When your spirit leans toward outdoor recreation of the competitive sort, we have that, too! Here is a sampling of the major attractions you'll find in Chenango County. In 1963, two canoes made a pilot trip down the Susquehanna River from Cooperstown to Bainbridge. Fifty annual races later, and the 4-day Regatta Weekend is attracting more than 1,500 paddlers to 50 races on the Susquehanna River. The Regatta culminates Memorial Day with a 70-mile endurance race from Cooperstown to Bainbridge, the worlds longest single-day flat water marathon canoe race, part of the North American Triple Crown of Canoeing. It's one of the best races in the country! Thousands of spectators and competitors from across the U.S. and Canada come to Chenango County for this exciting event. 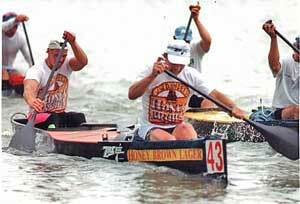 Professional, Olympic hopefuls and amateur canoeists alike enjoy the fun and glory of this famous race weekend. For those who will not be in the water there is plenty to do on land from games and rides to crafts, live bands, shopping and fireworks and food. If Basketball is more your style, check out the Gus Macker 3-on-3 Basketball Tournament in July. "The Macker," held in Norwich, attracts basketball enthusiasts from ages seven to 64 each year. Teams have been known to come from as far away as North Carolina, Georgia and California, as well as from throughout Central New York. 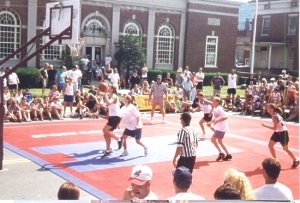 Since 1987, the Macker U.S. tour has expanded, holding a total of 972 tournaments. In Norwich, Main Street is closed to traffic, and basketball courts and bleachers take center stage. You'll see special competitions and some of the wildest basketball playing around. Sponsored by the Norwich YMCA, this is truly a family event. Don't miss "The Macker." The first Sunday in September, the Chenango County Historical Society (CCHS) sponsors their annual Antique Show. This is one of New York’s most popular and enduring antiques shows, held since 1977. This one-day show is full of quality dealers that draw an excited following that comes right at 8 a.m.! Approximately 60+ varied vendors, with displays indoors and out, rain or shine, at the Chenango County Fairgrounds, with a terrific assortment. Some Historical Societies have exhibits. 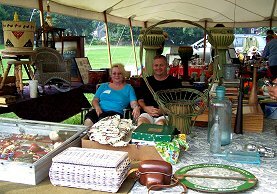 At past shows there have been antique publications, linens, toys, glassware, porcelains, jewelry, clothing, tools, collectibles, currency, paintings, furniture and more. Some crafts. Concession foods available. Seventy-six trombones is only a pittance compared to the massive Sherburne Pageant of Bands which celebrated its 60th anniversary in 2009, starting with just nine bands in 1949! Held the first weekend in June in Sherburne, this spectacular event features high school bands from throughout Central New York competing in parade and field events. They also have small ensemble, jazz and colorguard competitions prior to the parade. The parade is a show of sight and sound not to be forgotten. After, the cadence competition, which includes drum line groups, begins in the school stadium. If you're a performing arts lover, Chenango County has an array of cultural opportunities. The refurbished Martin W. Kappel Theater in downtown Norwich is an intimate theater and has a unique gallery space. Throughout the year, this is the site of band concerts, dance reviews, and theater productions, featuring local, regional and national talents. The expansive, sunlit Mariea Brown & Raymond Loft Galleries space hosts a new exhibit opening every month. Visits to the gallery, located at the 9 Maple Street entrance of the Arts Council, are always free and open to the public. The center is operated by the Chenango County Council of the Arts. The Earlville Opera House offers a summer season of music, theater, and cultural events. 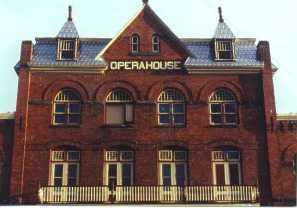 The opera house is a refurbished theater that first opened its doors in 1893. Through the loving hands of caring citizens, it was restored and has been placed on the national Register of Historic Places. From May to mid-September, it is the locale for art exhibits, dramatic performances and concerts from classical to Cajun. The Earlville Opera House has a historical mystique that is enhanced by the arts and culture it shares with its visitors. Come experience its ambiance with us. In September, Chenango County offers a major event you won't find anywhere else in the world. Colorscape Chenango is a celebration of the arts. It was created by area artists and residents who believe the best we have to offer should be shared with today's young artists. Join the thousands of visitors who come to Norwich each year to celebrate the arts with music, dance, entertainment, juried art exhibits and crafts, as well as the artwork of children and young adults. Through the streets, you'll find hands-on artistic experiences in which you and your children can take part. All activities and materials are supervised and are free of charge. You'll find craft demonstrations, dance programs, drumming, and dozens of other interesting activities -that change each year- during this special two-day festival. Summer isn't over until you and your family have been to Colorscape Chenango.